When FIU students David Shor and Leonard Foret packed their bags and headed for the Independent University of Moscow in September, where they are participating in the Math in Moscow program, they weren’t sure what to expect. 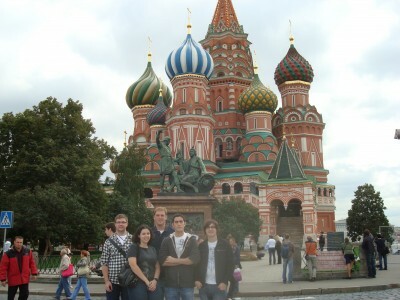 Leonard Foret and David Shor (first and second from right) pose with other students in the program in front of Saint Basil's Cathedral. Shor, 18, and Foret, 25, both seniors, were awarded National Science Foundation grants to participate in the 15-week program, which offers foreign students the opportunity to study math and computer science with internationally recognized Russian research mathematicians and helps them gain admission to prestigious graduate-level math programs. The FIU students take classes with 18 other scholarship winners from around the world and one course with Russian students, who go out of their way to make them feel welcome and show them around Moscow. 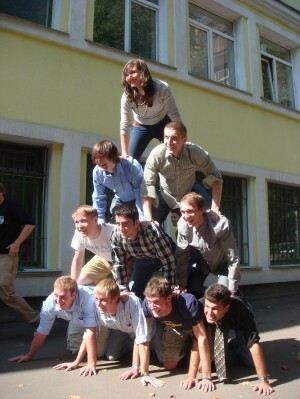 David Shor (in plaid shirt) and Leonard Foret (in row above Shor, wearing blue shirt) posing in a human pyramid in a group photo for the Math in Moscow program. Shor and Foret describe their Russian professors’ teaching styles as engaging and their studies as extremely rigorous. Classes are scheduled from 9 a.m. to 5 p.m. and sometimes don’t end until 7 p.m.
It’s a no-frills lifestyle at the dormitory where they’re living, which costs $100 a semester. “We have to cook for ourselves and take communal showers, which took some getting used to,” Shor admitted. Shor and Foret are learning Russian and have had no problems using the Metro and navigating their way to restaurants and stores around Moscow. Occasionally, their lack of familiarity with the language causes a minor glitch. “We went to the grocery store and bought a can of what we thought was tomato sauce and put it on spaghetti, and it turned out to be ketchup,” Foret explained. Foret and Shor are enjoying the experience, and hope to get another scholarship that will extend their stay in Russia through the spring semester. “FIU students who are thinking about participating in this program should just come and not worry about anything – but pack some extra mattresses,” Shor advised.